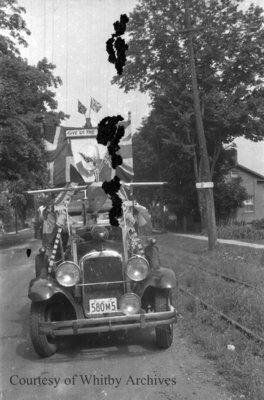 A black and white negative of a car decorated in advertisements for a Victory Loan campaign during World War Two. View is of the front of the car. A picture of Winston Churchill is attached to the front of the Union Jack flag. Above the picture reads "GIVE US THE TOOLS". This negative was found in a box of Marjorie Ruddy negatives and has started to degrade. There is no information about the negative. Victory Loan campaigns were established by the Government of Canada during the World Wars to raise funds for the war effort. Victory Loan Campaign, c.1941, Marjorie Ruddy. Whitby Archives A2013_040_636A.